High performance motor with a maximum flow rate of 1980 l/h and a maximum head height of 2 m. The flow rate can be mechanically regulated using a valve (not supplied with the pump). Pumps coarse debris up to 4 mm in size. Including special hose adapter with threaded collar for connecting hose sizes ¾", 1", 1 ¼" and 1 ½". 3 + 2 year guarantee. 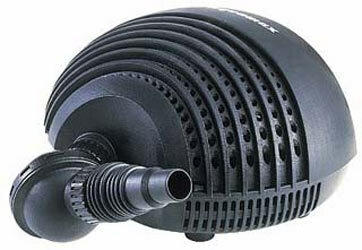 All filtration and watercourse pumps have a rated voltage of 220-240V/50Hz. Power consumption is 32 watts, cable length is 10 m.